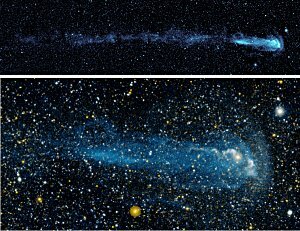 Sequence of images shows supernova start to finish. The top left image shows the galaxy before the supernova. At top right, the bright UV flash called the shock breakout indicates a red supergiant has collapsed. At bottom left, moments later, the flash is mostly gone. As the debris expands, it heats up again and becomes brighter (bottom right). The supernova became 10 times the size of the original over the following few days, thus becoming visible to supernova hunters. By all outward appearances, the red supergiant appeared normal. But below the surface, hidden from probing eyes, its core had already collapsed into an ultra-dense neutron star, sending a shock wave racing outward from the star's center at around 50 million kilometers per hour. The shock wave superheated the plasma in its path to almost a million degrees Kelvin, causing the star to emit high-energy ultraviolet (UV) radiation. About six hours later, the shock wave reached the star's surface, causing it to explode in a Type IIP supernova named SNLS-04D2dc. Long before the explosion's visible light was detected by telescopes on Earth, NASA's Galaxy Evolution Explorer (GALEX) space telescope captured the earlier pulse of UV light — scientists' first glimpse of a star entering its death throes. And that's exactly why astronomers are so excited. Observing the beautiful nebula left behind by a supernova doesn't reveal much about what the star was like before it exploded; most of the evidence has been obliterated. Information encoded in these UV "pre-flashes” could offer scientists an unprecedented window into the innards of stars on the verge of exploding. In this case, Schawinski and his colleagues calculated that just before its death, the star was 500 to 1000 times larger in diameter than our sun, confirming that the star was in fact a red supergiant. “We've been able to tell you the size of a star that died in a galaxy several billion light-years away,” Schawinski marvels. “GALEX has played a very important role in actually seeing this for a few reasons,” Schawinski says. First, GALEX is a space telescope, so it can see far-UV light that's blocked by Earth's atmosphere. With these advantages, GALEX is uniquely equipped to catch a supernova before it explodes. “Just when we like to see it,” Schawinski says. For more information, visit www.galex.caltech.edu, “Ultraviolet Gives View Inside Real 'Death Star'.” Kids can check out how to make a mobile of glittering galaxies at spaceplace.nasa.gov/en/kids/galex_make1.shtml . 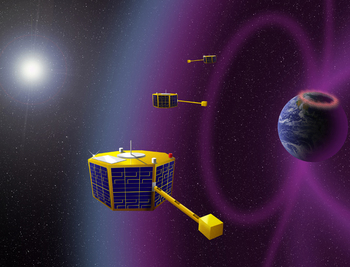 The Space Technology 5 micro-satellites proved the feasibility of using a constellation of small spacecraft with miniature magnetometers to study Earth's magnetosphere. Congratulations! You're an oceanographer and you've just received a big grant to investigate the Pacific Ocean. Your task: Map the mighty Pacific's wind and waves, monitor its deep currents, and keep track of continent-sized temperature oscillations that shape weather around the world. Funds are available and you may start immediately. Oh, there's just one problem: You've got to do this work using no more than one ocean buoy. Yet, for Le and her space scientist colleagues, this was exactly what they have been expected to accomplish in their own studies of Earth's magnetosphere. The magnetosphere is an “ocean” of magnetism and plasma surrounding our planet. Its shores are defined by the outer bounds of Earth's magnetic field and it contains a bewildering mix of matter-energy waves, electrical currents and plasma oscillations spread across a volume billions of times greater than the Pacific Ocean itself. In March 2006 NASA launched a trio of experimental satellites to see what three “buoys” could accomplish. Because they weighed only 55 lbs. apiece and measured not much larger than a birthday cake, the three ST5 “micro-satellites” fit onboard a single Pegasus rocket. Above Earth's atmosphere, the three were flung like Frisbees from the rocket's body into the magnetosphere by a revolutionary micro-satellite launcher. Space Technology 5 is a mission of NASA's New Millennium Program, which tests innovative technologies for use on future space missions. The 90-day flight of ST5 validated several devices crucial to space buoys: miniature magnetometers, high-efficiency solar arrays, and some strange-looking but effective micro-antennas designed from principles of Darwinian evolution. Also, ST5 showed that three satellites could maneuver together as a “constellation,” spreading out to measure complex fields and currents. Learn more about ST5's miniaturized technologies at nmp.nasa.gov/st5. Kids (and grownups) can get a better understanding of the artificial evolutionary process used to design ST5's antennas at spaceplace.nasa.gov/en/kids/st5/emoticon. Ozone behaves differently at different altitudes in the atmosphere. High in the stratosphere and at mid-troposphere it has positive effects on life at the surface. At the top of the troposphere ozone is a greenhouse gas and at the surface it makes smog. Scientists now have an unprecedented view of this mid-altitude ozone thanks to an instrument aboard NASA's Aura satellite called the Tropospheric Emission Spectrometer—"TES" for short. 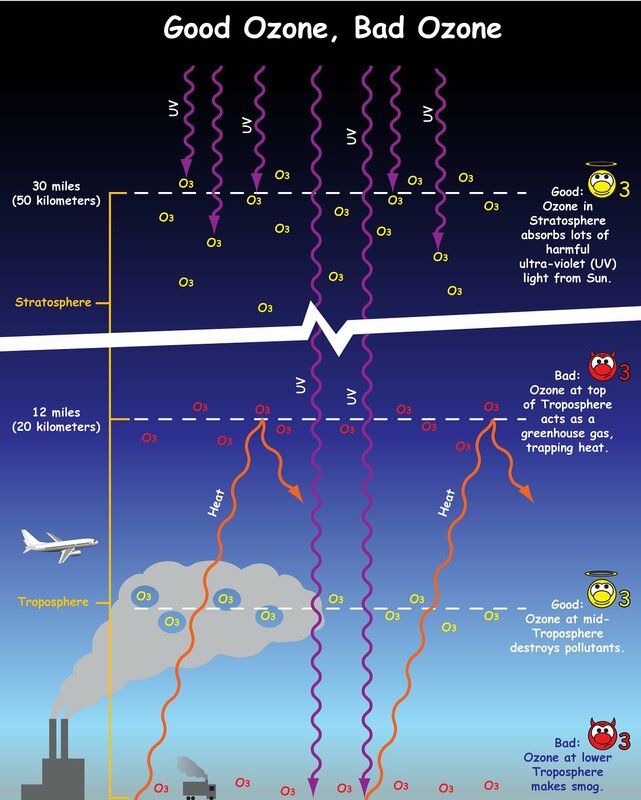 Learn more about TES and the science of ozone at tes.jpl.nasa.gov/. Kids can get a great introduction to good ozone and bad ozone at spaceplace.nasa.gov/en/kids/tes/gases. Making science edible--and sweet--is a reliable way to attracts kids' interest. The new "Gummy Greenhouse Gases" activity on The Space Place web site makes it fun and easy to learn a bit of chemistry and to find out why too many of these kinds of molecules in the air are likely to cause Earth to get warmer. At http://spaceplace.nasa.gov/en/kids/tes/gumdrops, kids use gumdrops and toothpicks to make simple molecules of ozone, nitrous oxide, carbon dioxide, water vapor, and methane. The curious can go on to http://spaceplace.nasa.gov/en/kids/tes/gases to learn more about the greenhouse effect and about the "good and bad" roles of ozone. A short video shows how new space technology can literally paint a 3-D picture of these gases all around the globe. Afterwards, the ghastly gases can be consumed (mind the toothpicks! ), thus helping the environment. Compass is built as two separate assemblies, the camera-gyro assembly and the data processor assembly, connected by a wiring harness. 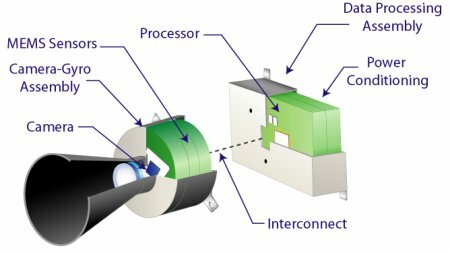 The technology uses an active pixel sensor in a wide-field-of-view miniature star camera and micro-electromechanical system (MEMS) gyros. Together, they provide extremely accurate information for navigation and control. “The wafers are actually very tiny gyros,” explains Artur Chmielewski, project manager at JPL for Space Technology 6 (ST6), a part of NASA's New Millennium Program. Traditional gyros use spinning wheels to detect changes in pitch, yaw, and roll—the three axes of rotation. For ST6's Inertial Stellar Compass, the three gyros instead consist of silicon wafers that resemble microchips. Rotating the wafers distorts microscopic structures on the surfaces of these wafers in a way that generates electric signals. The compass uses these signals—along with images of star positions taken by the camera—to measure rotation. “It just performed beautifully,” Chmielewski says. “The data checked out really well.” The engineers had hoped that ISC would measure the spacecraft's rotation with an accuracy of 0.1 degrees. In the flight tests, ISC surpassed this goal, measuring rotation to within about 0.05 degrees. That success paves the way for using ISC to reduce the cost of future science missions. When launching probes into space, weight equals money. 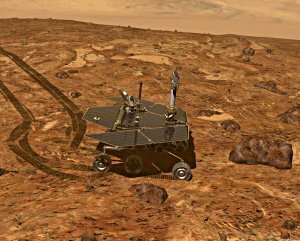 “If you're paying a million dollars per kilogram to send your spacecraft to Mars, you care a lot about weight,” Chmielewski says. At less than 3 kilograms, ISC weighs about one-fifth as much as traditional stellar compasses. It also uses about one-tenth as much power, so a spacecraft would be able to use smaller, lighter solar panels. Engineers at Draper Laboratory, the Cambridge, Massachusetts, company that built the ISC, are already at work on a next-generation design that will improve the compass's accuracy ten-fold, Chmielewski says. So ISC and its successors could soon help costs—and spacecraft—stay on target. The Dust Bowl. Hot, loopy solar gases. Killer Katrina. Combining dramatic images of Earth and space weather with the challenge of an old-fashioned slider puzzle, the new "Slyder" game on the SciJinks Weather Laboratory website will capture the attention of any middle-schooler--and maybe even their parents and teachers. Players pick from a rich variety of captioned images, including photos from the ground, photos from space, and artist's renderings. After picking a difficulty level (3x3, 4x4, 5x5 grids), the player slides the scrambled tiles around to make a whole picture again. Go to http://scijinks.gov/weather/fun/slyder to become the newest Slyder buff! 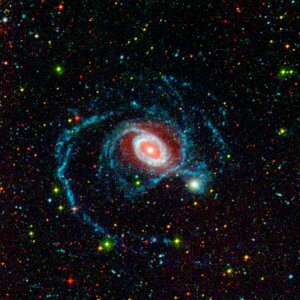 In this image of galaxy NGC 1512, red represents its visible light appearance, the glow coming from older stars, while the bluish-white ring and the long, blue spiral arms show the galaxy as the Galaxy Evolution Explorer sees it in ultraviolet, tracing primarily younger stars. (Credit: NASA/JPL-Caltech/DSS/GALEX). At one time or another, we've all stared at beautiful images of spiral galaxies, daydreaming about the billions of stars and countless worlds they contain. What mysteries—and even life forms—must lurk within those vast disks? Now consider this: many of the galaxies you've seen are actually much larger than they appear. NASA's Galaxy Evolution Explorer, a space telescope that “sees” invisible, ultraviolet light, has revealed that roughly 20 percent of nearby galaxies have spiral arms that extend far beyond the galaxies' apparent edges. Some of these galaxies are more than three times larger than they appear in images taken by ordinary visible-light telescopes. 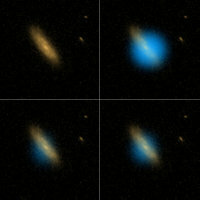 “Astronomers have been observing some of these galaxies for many, many years, and all that time, there was a whole side to these galaxies that they simply couldn't see,” says Patrick Morrissey, an astronomer at Caltech in Pasadena, California, who collaborates at JPL. The extended arms of these galaxies are too dim in visible light for most telescopes to detect, but they emit a greater amount of UV light. Also, the cosmic background is much darker at UV wavelengths than it is for visible light. “Because the sky is essentially black in the UV, far-UV enables you to see these very faint arms around the outsides of galaxies,” Morrissey explains. These “invisible arms” are made of mostly young stars shining brightly at UV wavelengths. Why UV? Because the stars are so hot. Young stars burn their nuclear fuel with impetuous speed, making them hotter and bluer than older, cooler stars such as the sun. (Think of a candle: blue flames are hotter than red ones.) Ultraviolet is a sort of “ultra-blue” that reveals the youngest, hottest stars of all. “That's the basic idea behind the Galaxy Evolution Explorer in the first place. By observing the UV glow of young stars, we can see where star formation is active,” Morrissey says. Spread the wonder by seeing for yourself some of these UV images at http://www.galex.caltech.edu. Also, Chris Martin, principle scientist for Galaxy Evolution Explorer—or rather his cartoon alter-ego— gives kids a great introduction to ultraviolet astronomy at http://spaceplace.nasa.gov/en/kids/live#martin. Every science fiction fan has pondered the weird implications of time travel. Can you travel into the future and find out the winning Super Lotto number -- then come back and buy a ticket? Would doing so be cheating the laws of physics (to say nothing of ethics?) Astrophysicist Marc Rayman toys with such ideas in this Space Place Musings Podcast. Go to http://spaceplace.jpl.nasa.gov/en/educators/podcast/ to subscribe to these Podcasts. Or listen now to this and the previous Podcasts on your computer or read the transcripts. Astronomers looking at new ultraviolet images from the Galaxy Evolution Explorer spacecraft were surprised to discover a 13-light-year long tail on Mira, a star that has been extensively studied for 400 years. Now you can. Just point your web browser to galex.stsci.edu and start exploring. That's the address of the Galaxy Evolution Explorer image archive, a survey of the whole sky at ultraviolet wavelengths that can't be seen from the ground. Earth's atmosphere blocks far-ultraviolet light, so the only way to see the ultraviolet sky is by using a space telescope such as NASA's Galaxy Evolution Explorer. “Mira shows us that even well-observed stars can surprise us if we look at them in a different way and at different frequencies,” Seibert says. The images from the ultraviolet space telescope are ideal for hunting new phenomena. The telescope's small, 20-inch primary mirror (not much bigger than a typical backyard telescope) offers a wide field of view. Each image covers 1.2 degrees of sky — lots of territory for the unexpected.